All shoes are in-stock and ship same business day if ordered by 2pm Pacific time. Free returns when using Paypal. Some coupon codes from our main site do not work on this site. 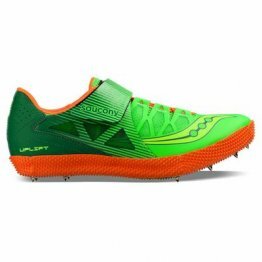 Track and Field event specific shoes and spikes. Bags of 100 ONLY (except 1" javelin spikes come in bag of 20, and blanks come 50/bag). Pyramid and Needle spikes. 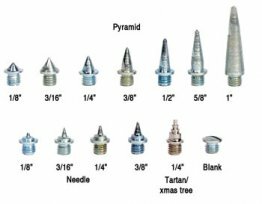 Pyramid spikes are for Dirt tracks only, Needle spikes are for synthetic (rubber) or dirt tracks. All spikes are Steel. X-mas tree (compression spikes) are for rubber tracks only. 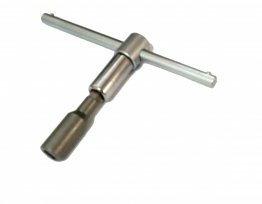 No way to lose grip with this wrench, sturdy steel with removable tip for regular or hex spikes. 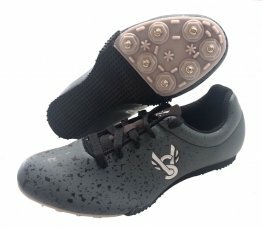 Durable and economical throwing shoe for Glide and Spin techniques. Increased outsole on toe area for protection in the ring. The perfect Youth spike for any event (except throws). 3/4 length midsole to support younger feet and perfect for beginning hurdlers who like a heel. The Uplift HJ is specifically designed for the high jump. Its lightweight upper features FlexFilm overlays, supportive synthetics and a multi-directional cross strap to lock the foot in place. The upper is combined with a a full-length plate and rubber outsole to provide great propulsion and proper traction on a variety of surfaces. Weight: 9.9oz. © 2017 - 2019 VS Running Shoes. All rights reserved.